We normally try not to post a lot of single track downloads here on Idol Threat since we like to give our readers more than a tiny taste (and we believe in the ideas of albums and projects as opposed to singles) but some projects are worth the hype. The collaboration of Dungeon Family ATL MC Killer Mike and underground veteran producer/rapper El-P bore amazing fruit with Mike's album "R.A.P. Music" becoming one of our favorite albums of last year. So when they announced that they would be officially forming a group and releasing a new album and summer tour you can imagine how excited that got us! This time around El-P will be sharing more of the rap duties in addition to producing all the beats as he and Mike create what will most likely be the best collaboration of the year. The duo will be releasing their full length Run The Jewels on A-Trak's Fool’s Gold records, who will be presenting it as a free download this June along with a limited edition physical release. 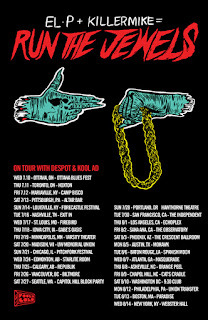 You can check out the dates for their summer tour in the poster to the left or after the jump and download a free track off of Run the Jewels called "Banana Clippers" featuring Outkast's Big Boi below.